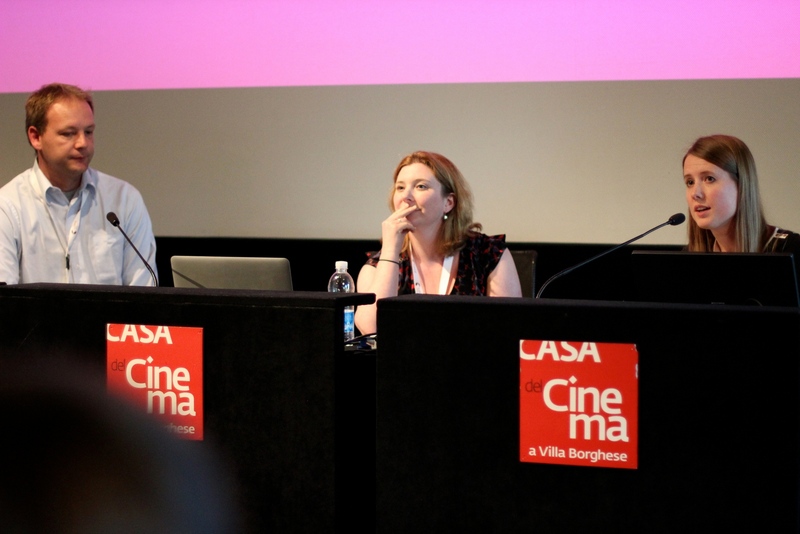 EUscreenXL gathered in Rome last week for our conference on the users and usage of audiovisual archives: “From Audience to User: Engaging with Audiovisual Heritage Online”. In this series of blog posts we fill you in on what happened. After lunch, the conference rode on with its first day packed with presentations. The slides Deutsche Welle’s Kay Macquarrie showed, opened with a colourful animation about Tom the reporter. Tom is not a big fan of the complications of his work, it seems, and would like smart technologies to help him out. Luckily, the AXES project has spent some time figuring out his wishes and aims to provide for his every search and sorting need. The search engine uses all sorts of automation and enrichment to decrease the searcher’s time effort. It assumes that researchers have wishes fully different to those of home users and media professionals who want to reuse content. The software will be made available under an open source license for those enthused and willing to try it out. AXES with Tom – If Only You Knew What’s In Your Archive! The demo Lotte Belice Baltussen and Lyndon Nixon showed, was dedicated squarely at the home user – and smart web editors. The LinkedTV project has the noble assumption that television audiences are not willing to switch off their brains when watching, but are most willing to use their smart devices to make themselves smarter too. In order to assist editors in providing a wealth of contextual information, the project searches for for that sweet spot where automatically enriched and linked metadata can provide a world of new experiences. In the Linked Culture demo the duo showed, the Dutch version of the Antiques Roadshow was enriched with images and explanations pulled in from Europeana. During the coffee break, we saw some conversing going on between the developers in the project and those involved in EUscreenXL, so keep posted to hear if this turns into pretty new uses of our linked data pilot. Mark Williams took to te stage again to this time root for his own project. The Media Ecology project, or MEP in short, is a fantastically ambitious and wide ranging project that brings together researchers, librarians, archivists and computer scientists and aims to harness the powers of two library and archive buzzwords: linked data and crowdsourcing. MEP provides access to the Library of Congress via Mediathread and allows a selected group of academics to update and improve on descriptions. The archives can then harvest back metadata generated through MEP project. The project’s access point provides enhanced search capacity for the LoC’s materials, enhances search capacity for other archives and helps the academic & scholarly community help in their workflow at the same time. An important aid in this process is the use of a controlled vocabulary, which in this project is baptised the Onomy. The project makes use of a wide range of open source tools, such as the Computational Cinematics Toolkit in Python and the related Tiltfactor, doing metadata games. The Q&A session focused on the benefits of crowdsourcing and lessons learned in this space, including how to convince archive personnel of the usefulness of involving non-professionals in describing archive content. The presentations led one commenter to describe his response as a Faustian dilemma, where he needed to choose between using one of the many fantastic tools available but unable to solve the growing gap between their development and their integration into teaching & digital/audiovisual literacy. As far as we could understand from the panel members, they all seemed to have good trust in their visions of smarter, connected, wired, searchable and automated collections – and the people we hope will be using them. 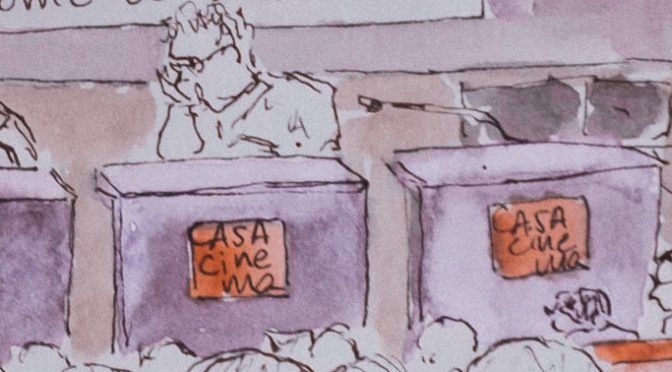 Drawing made at the conference by Montse Fortino.